Sorry ah...mouth cannot open coz full of this Nasi Briyani. Yes, we were at Restaurant Salma located at No. 19, Jln Waruna Ar U5/ar, 40150 Shah Alam, Selangor. Mamarazzi was hungry and didn't know what to eat as more restaurant and stalls was closing as it was already 2pm. Thought of eating Maggi Goreng but then she saw Salma still have Nasi Briyani. We ate this Nasi Briyani mana times before. taste not bad. Got the usual stuffs like raisin and gajus. Mamarazzi love the chicken. Very soft, tender and well marinated. 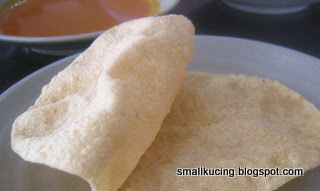 It comes with Papadum. My favourite. The nasi Briyani comes with Acar. 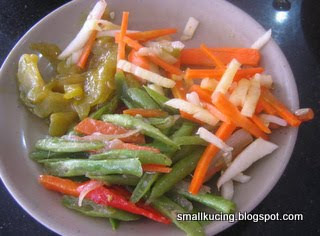 But Mamarazzi added two more types of vegetables. Looked messy hor? Actualy it wasin two separate plates but Mamarazzi ate liao baru remember have to snap photo. Thus all put into one plate loh. As for me, I was busy stuffing my mouth with Papadum. 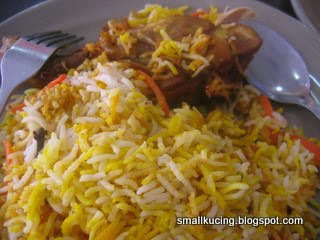 I like nasi beryani too. 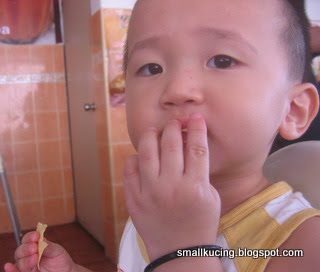 And i love to eat it with my hands ^_^ It taste better. 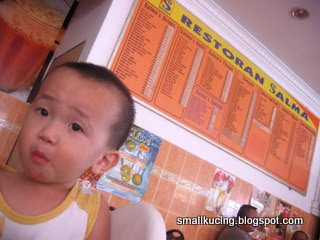 mamarazzi, your son seems to like indian food very muchie! any hope for an indian daugther in law? I used to stay in Shah Alam too. You know where the SRI CAHAYA school is? Always love to cook it too. Can litle Pete follow Mamarazzi eat out too? ha ha ha! Agak Agak know where the school la. You stayed there before ah? Uiks? so cheap ah your side. This one is like rm5 or rm6 wor.